Rick Florino seems to have a knack for surprise endings and eerie storytelling. 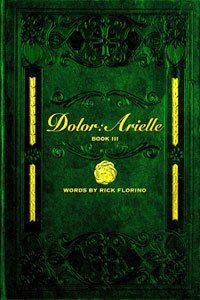 In Dolor: Arielle Book III, Sam, the main character gets involved in some strange situations, which impact his life a lot more than he cares to think. Florino’s novella starts with Sam’s inner thoughts regarding his lawyer job and issues with his wife, Arielle. Sam’s written as an average guy with annoying clients, and the stress of his marriage impacting work. The reader finds out that ironically, he is a divorce lawyer. Sam and Arielle’s issues wind up in a twisted connection to one of his client’s cases. Florino brilliantly connects the strange occurrences of a symbolic pentagram to Sam in a way that keeps the reader hooked throughout. Although the novella is roughly thirty pages, it is chock full of symbolism, character development, and intriguing suspense.